I'm a software tinkerer and occasional computer scientist. This blog is a platform for sharing my explorations: mostly in software development and game design, but ranging through a host of interesting technologies. Expect articles, projects, tutorials, and unabashed geekery. Updated my puzzle game flow code to support blending colors, along with lots of tweaks and refactoring. Two related articles to write as I finish it up: how the flow code works, and some pros and cons of SVG with CSS animation. Tweaking my puzzle game so that mixing up channels produces other colors. The flow logic is disabled here (and colors randomized), but you can see gradients from the G and B sources to their connected pipes. Spent a few days building the flow logic for my puzzle game. Almost works... except for some very confused conflict markers near the end of the animation. 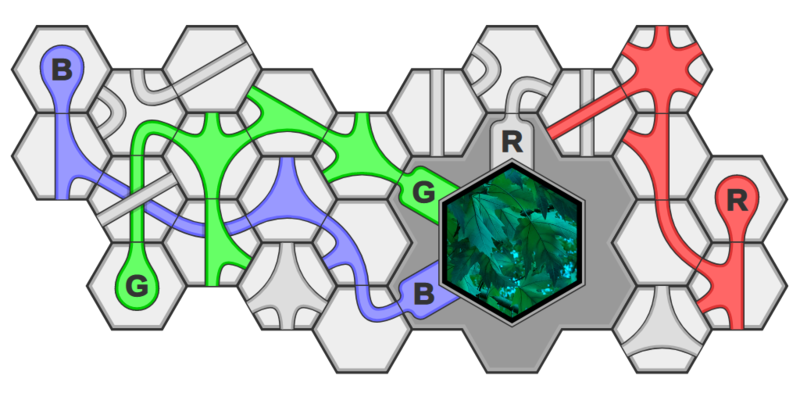 Any conflicting connections spawn an X particle and the tile keeps turning. The more I play with it (now that it's interactive), the more it feels like mixing the colors is the correct response. So one more trip through the drawing board during the code cleanup. Contining my simple puzzle game with some animation. When you click or tap on a tile it bounces up and spins. Color flows through the pipes, hopefully to the goal. This is an art prototype for a simple puzzle game inspired by digital cameras. The channels carry color to the image, which appears as you connect the sources. If you're reflexively clicking that last red pipe, it's obviously on the right track!